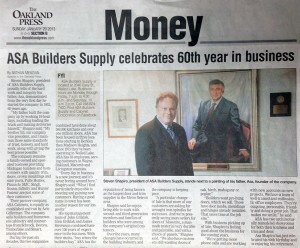 Steven Shapiro, president of ASA Builders Supply, proudly tells of the hard work and integrity his father, ASA, demonstrated from the very first day he started the company in 1952, 60 years ago. The company remains a family-owned and operates business providing Michigan builders and homeowners with quality trim, doors, crown moldings and stair parts. Pulte Homes, Pinnacle, MJC, Singh, Nosan, Infinity and Hunter Pasteur are just some of their customers. Their partners company, ASA Cabinets, is equally as established and run by Arie Gillerman. The company sells builders and homeowners cabinetry and countertops from Schrock, Decora, Timberlake and Smart, among others.